On Sunday Isla Fisher took time out from promoting her new film, The Great Gatsby, to accompany her girls Olive & Elula to a birthday party in the park. The girls were dressed in Spring dresses, matching cropped sweaters and tights. At the party they played ball with their friends, climbed on the jungle gym and visited with Rapunzel from Tangled. 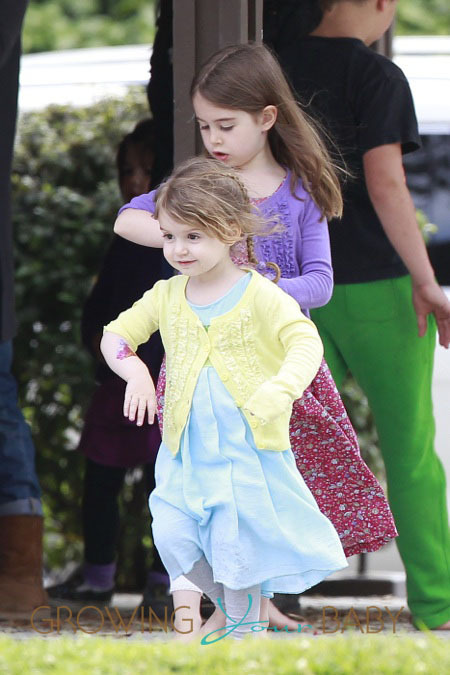 After her girls were born, Isla took time off from acting to be a mom. During a recent interview she discussed her hiatus and why it was so important. ‘When you come back in, the perspective has changed. I truly believe you can’t have it all and you shouldn’t want to,’ she added.